This cocktail recipe was inspired by the one they serve at 69 Colebrook Row, a superb little cocktail bar in London. The trick is to get a good balance of flavours. 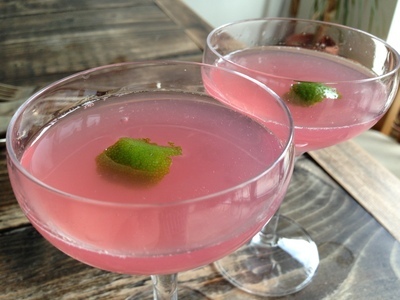 It should taste distinctly rhubarby, with a good grown-up gin kick, and just a hint of lime. All material © copyright 2006-2014 Anna Colquhoun and Matthew Purver.